Dear Readers, Here we have provided some tips to answer the “Fill in the Blank” Questions in the English Section. Candidates those who have difficulty in this section can use this tips to score more marks. Step 1: Initially, read the sentence carefully and try to fill the missing word without looking the given options. Step 2: Then, check the options given below and find the best word which replaces the word that you had thought initially. Step 3: Insert the word that you have chosen from the option and read the sentence again. Check that the word you have inserted in the blank, enables you to read the sentence correctly and smoothly and also check whether it gives you proper meaning. Step 4: After filling all the blanks, once again read the sentence and make sure that there are no grammatical error in the sentence. 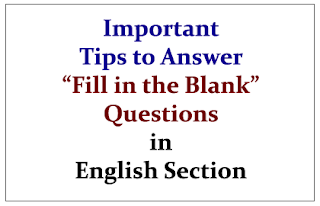 · Fill in the Blanks is one of the most important questions in the English Section, from which you can score more marks easily. To answer these questions, you must have very good English Vocabulary. · Important thing is, to understand the meaning of the sentence properly; if you have understood the question properly you can also get some clues from the questions, which will help you to choose the answer correctly. So read the sentence very carefully. · Don’t forget to note the Grammar Clues, in the given sentence there will be some hidden grammar clues, by using those clues you can easily identify the answer. For example, if the article “an” comes before the blank means, the answer must begin with a vowel. · While reading the sentence you need to think logically and recognize the correct word which will give proper meaning for that sentence. · When you read the sentence and option in the question, try to find the nature of the missing word, whether the missing word implies positive or negative meaning, and this will help you to identify the correct word in the option. · Each question consists of two blanks, compare the both words given in the option and eliminate the option which not suits the both blanks. · Some questions may ask from the Idioms and Phrase, you must be prepared to face those types of questions. So you should have good knowledge in the Idioms and Phrases also. · After choosing the options, check the sentence once again and make sure that the meaning of the sentence is not changed. · Do not spend much more time in one question, if you are unable to find the correct answer means skip that question and step forward.